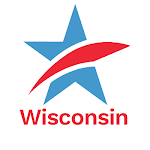 After nearly a year of the most dishonest, destructive and incompetent President of the United States in history – and another year of the most anti-progressive, least ethical, most secretive and anti-democratic Governor and State Legislature in state history – the United States, Wisconsin and CC/WI all still stand! That is no small achievement in the current political atmosphere and power alignment – both in Washington, D.C. and in Madison, WI. In Wisconsin, we have even advanced the cause of redistricting reform and judicial recusal, and have not lost any further ground in voting rights and campaign finance reform. Yet. CC/WI has been a leader in the statewide effort to enact a nonpartisan redistricting process for Wisconsin since 2013, when we united legislators, reform organizations and citizens in support of adopting Iowa’s nonpartisan redistricting process. We forced the Republican-controlled Assembly to finally hold a public hearing on the issue in 2016 and we have mobilized unanimous support from all the state’s daily newspaper editorial boards. The Capital Times cartoonist, Mike Konopacki, recently created this cartoon with CC/WI as the subject. This year, we took the leading role in forcing GOP legislative leaders to cap the amount of taxpayer money they will spend on defending Wisconsin’s unconstitutional 2011 legislative district maps and to disclose the law firms they hired, and we have been all over the state educating Wisconsinites about the pending case before the U.S. Supreme Court, Gill v. Whitford, which declared Wisconsin’s 2011 maps illegal, and which would, if the nation’s highest court upholds a federal court decision, dramatically curtail hyper-partisan gerrymandering, nationwide. New CC/WI State Chair, former State Senator Tim Cullen of Janesville, is a leader in the landmark court case. We have also gathered nearly 4,000 of our target goal of 5,000 signatures in support of redistricting reform legislation – Senate Bill 13/Assembly Bill 44 – which we hope to reach in early 2018. If you have not signed the petition yet, or have but know others who haven’t, please go here and do so! CC/WI continues to counter the suppressing effect of Wisconsin’s extreme and restrictive voter photo ID law (in full effect since 2016) by providing information to eligible citizens about what they need to be able to vote and what documentation they must have to obtain the requisite form of photo ID. We have been the leading resource for college and university students to find out if their student ID is acceptable at polling places and how to get the correct form of ID if it isn’t. CC/WI partners particularly closely with the League of Women Voters of Wisconsin to get more citizens the information they need to vote. This is critically important because the voter photo ID law caused Wisconsin to experience a large drop off in voter turnout in 2016 compared to 2012 and Donald Trump carried the state by just about 22,000 votes – in part because of this voter suppression. In late July, CC/Wisconsin single-handedly reignited the important issue of recusal for judges in the receipt of campaign contributions or benefiting from special interest “outside” electioneering spending, with the recent opinion-editorial in the Milwaukee Journal Sentinel, Wisconsin’s largest newspaper. 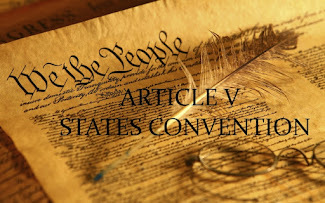 The conservative majority (5 of 7) on the Wisconsin Supreme Court last April voted 5 to 2 not to adopt sensible recusal rules for judges at all levels proposed last January by 54 retired state jurists, including two former Supreme Court justices. The majority would not even allow a public hearing on the matter. Wisconsin currently ranks 47th of the 50 states in the strength of its recusal procedures. But the issue is front and center in the upcoming Wisconsin Supreme Court election in April, 2018 to replace retiring ultra-conservative justice Michael Gableman, the state “poster child” for the need for judicial recusal. CC/WI organized well-attended public hearings and forums on the issue during October in Milwaukee, Green Bay and Madison, and former Wisconsin Supreme Court Justices (Janine Geske and Louis Butler), current Supreme Court Justice Ann Walsh Bradley, and other prominent jurists participated. CC/WI must and will continue this critical work in early 2018. CC/WI has continued to call out Gov. Scott Walker and the anti-reform, reactionary Wisconsin Legislature on other issues as well and we will never give up pushing for the common sense, effective political reform measures that once made this state a model for the nation. We will continue to educate Wisconsinites about, and mobilize citizen support for, these reforms until we prevail. We need your end-of-the-year support, as soon and as generous as possible, so that we can carry the fight into 2018 – a critical election year in Wisconsin with a pivotal State Supreme Court contest in April and Gubernatorial, State Legislative, and U.S. Senate and House elections. Please help us now so that we can continue our mutual quest to increase the number of Wisconsinites advocating for change and the achievement of genuine, progressive reform. "Snail mail" your check or credit card payment (Visa, MC, American Express, Discover) to Common Cause in Wisconsin, P.O. Box 2597, Madison, WI 53701-2597, or you can make a contribution online to CC/WI here. With best wishes for the Holiday Season and for a happy, healthy and peaceful New Year. P.S. For the past two decades, CC/WI has been one of Wisconsin’s most respected political reform advocacy organizations. One reason may be our doggedness and persistence. Please read this newspaper editorial from earlier this year that details how CC/WI just won’t give up. Neither can you. Wisconsin’s state motto is “Forward!” Let’s go that way. Help us now! 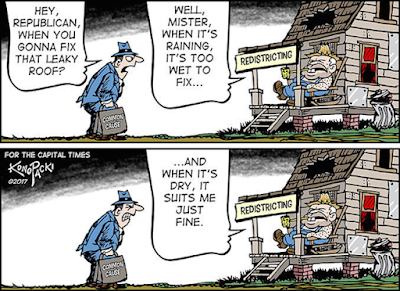 Demand Public Hearings in the State Senate and Assembly on Redistricting Reform Legislation Now! Wisconsin Assemby Speaker Robin Vos and Senate Majority Leader Scott Fitzgerald have said recently that the Republican-controlled Legislature is by and large finished with its legislative agenda for the 2017-2018 session. 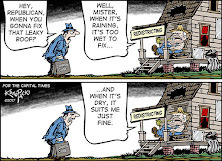 They are expected to adjourn in early to mid-Spring for the year to "concentrate" on stockpiling special interest campaign cash for their re-election campaigns, while continuing to draw full-time salary and benefits. Great gig, if you can get it. Keep in mind, Wisconsin is by far the smallest state in the nation, population-wise, that has a "full-time" Legislature. For what? Now, it's possible the Legislature may move to do a few more things during the first three months of 2018. Perhaps they will decide to exempt toddlers who have concealed carry permits from the 21-year-old legal drinking age in Wisconsin. Or, perhaps they will act to outlaw gatherings of two or more Wisconsinites who talk about the rotten state of political discourse as potentially "riotous" behavior. Or, officially change the name of the Wisconsin Department of Natural Resources to "Do Not Resuscitate," thus saving taxpayers nearly $43 because the agency can continue to use its DNR stationery. But we don't need environmental regulations in this state any more! Having too much time on their hands is a problem for this Legislature. But there is at least one more thing they really ought to do before they close up shop to beg for campaign cash in 2018. 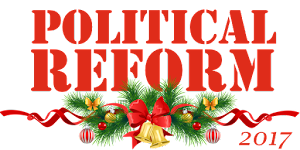 Fitzgerald and Vos must allow public hearings to be scheduled and conducted on redistricting reform legislation before the Legislature adjourns sine dine in 2018. That legislation is Senate Bill 13 and Assembly Bill 44 – the exact same legislation that has been introduced for the past four legislative sessions. GOP legislative leaders didn't allow public hearings during 2011-12 or 2013-14. Vos finally did do it in 2015-16, on April 1, 2016 – after the legislative session officially adjourned and only because Common Cause in Wisconsin and The Wisconsin State Journal teamed up to embarrass Assembly Campaign and Elections Committee Chair, State Rep. Kathleen Bernier (R-Lake Halle), into holding one. But during 2017, when the unconstitutional Wisconsin 2011 gerrymandering lawsuit is currently before the U.S. Supreme Court, and public interest in this critical issue is extremely high, there has been nothing but "crickets" from Fitzgerald and Vos. In fact, Vos recently went out of his way to criticize Republican Governor John Kasich of Ohio for having the audacity to support fair election maps and oppose hyper-partisan gerrymandering. How dare that Kasich side with citizens over political bosses! 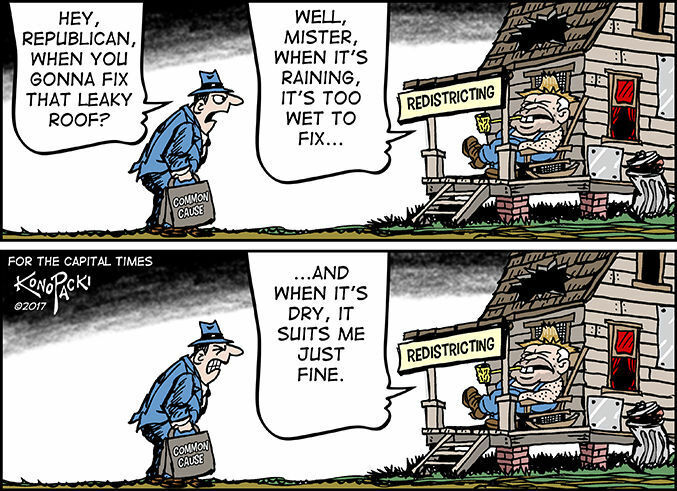 And, if you haven't done this yet, please sign our online petition in support of the redistricting reform legislation. If you have already signed it, please urge family and friends to do so at your upcoming Thanksgiving gathering! Ending hyper-partisan gerrymandering is a subject everyone can agree on around the holiday table! :-) We have nearly 4,000 individual signees so far and would like to boost that total up to 5,000 by year's end. Thanks so much for your active support for democracy in Wisconsin, and Happy Thanksgiving to you from all of us at CC/WI! Next Tuesday evening, October 24th, Common Cause in Wisconsin is holding the last of three town hall "public hearings" on judicial recusal. This event will take place from 6:30PM to 8:00PM in the Grand Hall at Capitol Lakes - 333 West Main Street, Madison, WI. 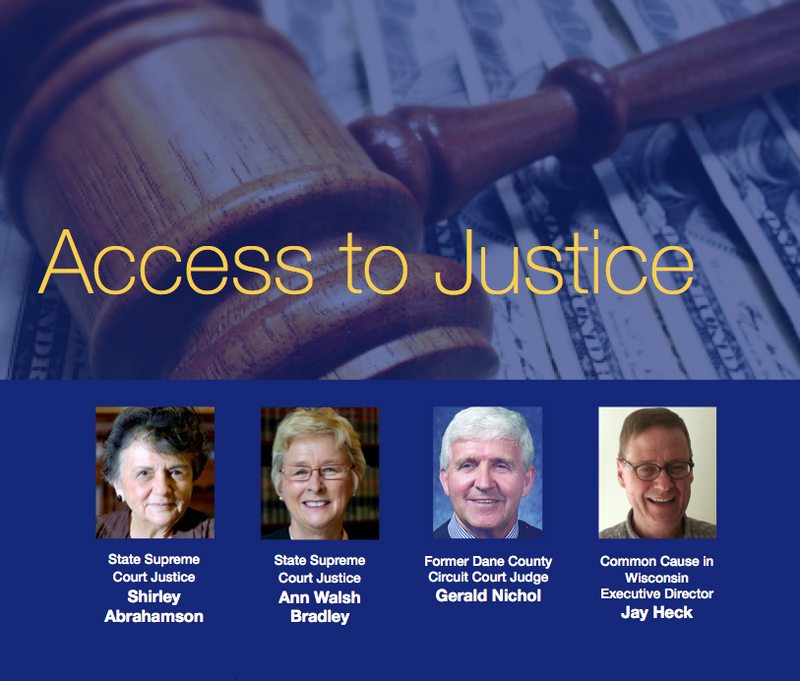 Wisconsin Supreme Court Justices Shirley Abrahamson and Ann Walsh Bradley will join former Dane County Circuit Court Judge Gerald Nichol as panelists. Nichol was the former Chair of the now-dissolved nonpartisan Wisconsin Government Accountability Board. If you have any questions, please call the CC/WI office at 608/256-2686 or email me at ccwisjwh@itis.com. I look forward to seeing you in person on October 24th! Please join our distinguished panel of legal experts and me tomorrow evening, October 11th, from 6:30 to 8pm at our Judicial Recusal Town Hall "Public Hearing" in Milwaukee. 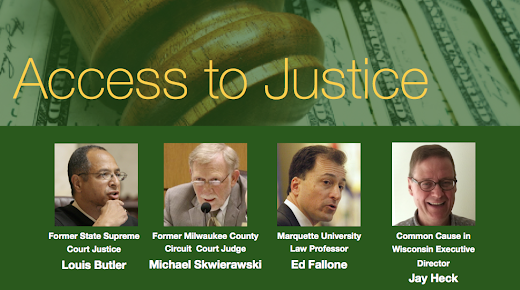 This event is free and open to the public and will take place from 6:30PM to 8:00PM in the Marquette University Law School Appellate Courtroom (Main Level) - 1215 West Michigan Street, Milwaukee, WI. 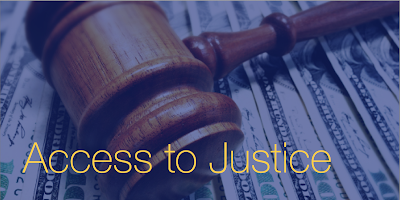 Wisconsinites would be shocked to know that our state is among the four states with the weakest recusal rules for judges receiving campaign contributions. In fact, our current state recusal "non-standard" essentially states that justices may decide for themselves whether to recuse in a case involving a party who contributed to them. It was written verbatim by a conservative special interest group in 2010! 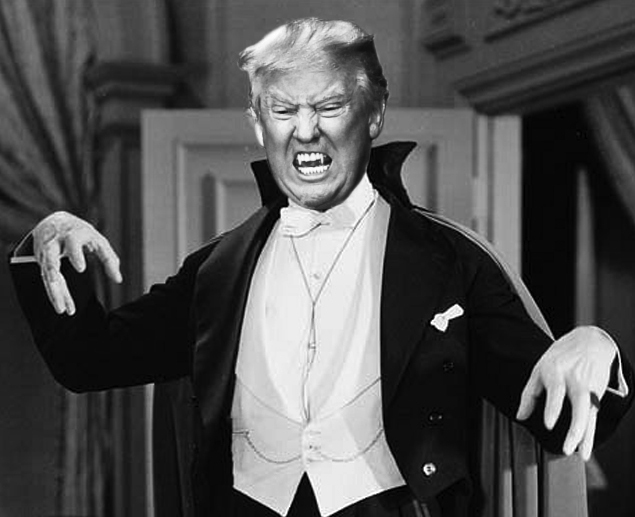 "Imagine you are a party to a court case and the party on the other side spent thousands of dollars to help elect the judge hearing your case. Would you be confident that you would receive your fair day in court? "In Wisconsin, this is not just a hypothetical." With a Wisconsin Supreme Court election coming up in early 2018 to replace retiring anti-recusal Supreme Court Justice Michael Gableman, it is imperative that Wisconsinites fully understand and raise their voices about this issue – which will be prominent in that election. The Capital Times published this editorial last week on the importance of these events as well. Please join us tomorrow night at this free event, where you will learn more about this vital issue, can ask questions, share your thoughts – and above all, make your voice heard. 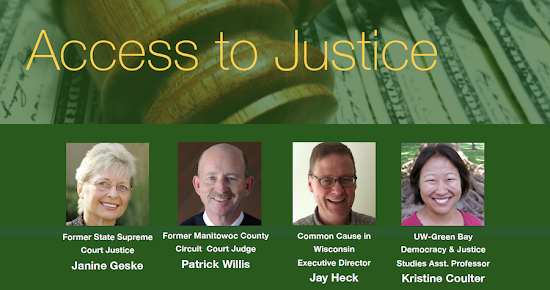 On Monday evening, October 2nd, Common Cause in Wisconsin is holding a town hall public hearing entitled "Access to Justice" from 6:30PM to 8:00PM at the University of Wisconsin - Green Bay in the University Union (Christie Theater) - 2420 Nicolet Drive, Green Bay, WI. Similar public hearings will be held later in October in Milwaukee and in Madison. Please join me and my fellow panelists: former State Supreme Court Justice Janine Geske and former Manitowoc County Circuit Court Judge Patrick Willis at this free event to learn more about this vital issue. Ask questions, share your thoughts – and above all, make your voice heard. 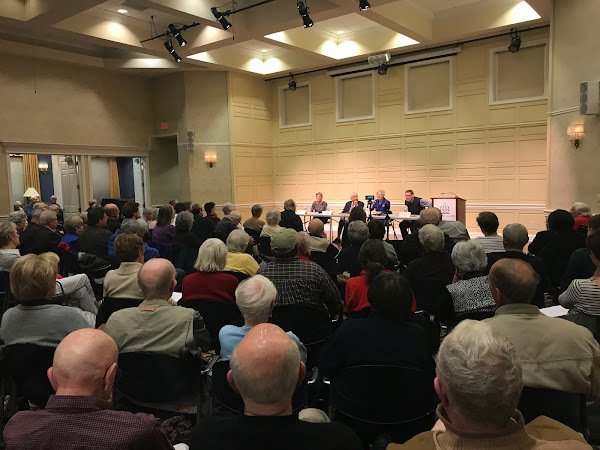 Co-sponsoring this event with CC/WI are the UW - Green Bay Political Science Department, the League of Women Voters of Wisconsin, the League of Women Voters of Greater Green Bay and the American Association of University Women-Wisconsin. If you have any questions, please call the CC/WI office at 608/256-2686 or email me at ccwisjwh@itis.com. I look forward to seeing you in person on October 2nd!